Westar Truck Centre offer great specials on trucks and accessories. Click here to view our latest offers. Click here to contact the Team at Westar Truck Centre today. We are a dedicated truck dealership that has been purpose-built to meet the needs of truck buyers and operators, with features to ensure customers have an unrivalled truck buying and service experience. 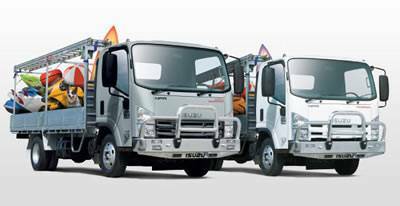 We have 6 Isuzu Sales Consultants who are well trained in serving and solving customer needs with the Isuzu range of trucks from the nimble 4500kg GVM N series through to the 425hp 6x4 C Series. Whether your application is a small tray truck, an 8x4 agitator or a 350 horsepower tipper, our staff have the experience and the tools to ensure a truck specification that not only optimises legal limits but ensures a comfortable and productive truck for years to come. We operate an in-house finance team - Nationwide Finance - that can provide you with an ultra-competitive and flexible finance package for your new Isuzu. All our Financial Consultants have years of automotive financial experience rounded out with the necessary truck industry know-how. Quite simply they understand the unique needs of truck buyers. Our highly experienced service technicians are all experts in their fields and Isuzu factory supported training ensures they are kept up to date with the latest service and repair techniques. As well as holding a massive inventory of Isuzu truck parts we also stock a comprehensive range of genuine parts for all makes of trucks and trailers. We also cater for major component manufacturers such as Eaton, Meritor (Rockwell), Spicer, Cummins and CAT to name a few.